If you’ve been following my posts on scheduling, you may have noticed that Thomas and Henry have a block called “Science Box Time.” This is a time of open ended science exploration facilitated by the handy little book Sandbox Scientist: Real Science Activities for Little Kids. I first discovered this book when I randomly checked it out from the library. I loved it, returned it, and forgot the name of it. A bit later I despaired when I couldn’t recall the name of it. All of my vague descriptions to the nice librarian and her creative searches yielded nothing. Then one day the title just came to me and I immediately jumped on Amazon and ordered my own copy of it. This book is very nearly perfect for teaching science to young children. And by young, I mean anywhere from age 2 up to middle school. In the early years, science is not about learning scientific facts. It is about the formation of scientific habits. It’s learning to think like a scientist. Science is learning to ask questions and to look for the answers through exploration and observation. Raising a scientist involves nurturing curiosity, and encouraging creativity. It means empowering children to discover, learn, and prove things for themselves rather than just accepting what they’re told. Science asks “Why? Really? What happens if I. . . ? How do you know? Show me. Let me see. Let me try. Prove it.” Science sounds an awful lot like an impudent teenager. Sandbox Scientist provides a list of science boxes you can assemble yourself that encourage children to ask these questions and to seek the answers for themselves through exploration and observation. The boxes work perfectly in a home environment because the materials they call for are cheap and easy to find. I am using the book to plan out six weeks worth of boxes at a time. For our first six weeks I went through and pulled boxes calling for water. This is not because I’m doing a water theme (though you could certainly use the book that way), but rather because I want to take advantage of the warm weather while we’ve got it. By assembling six weeks worth of boxes at a time, I can make one trip to the hardware store and/or dollar store to get what we need and put everything together at one time. My boxes are now ready to go when I need them. 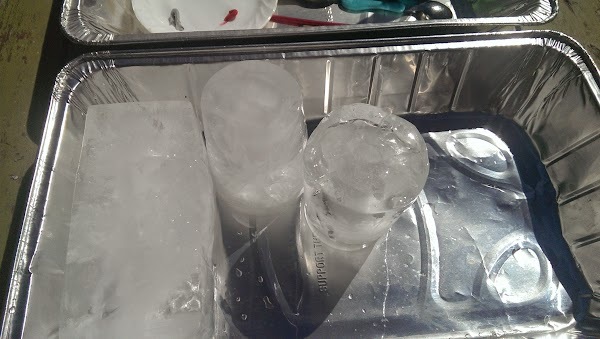 Yesterday my kids played with the Ice Box. One of the best things about the ideas in this book is that they are suitable for my 3 year old and my 9 year old. They approach the material in different ways, and they learn from each other in the process. 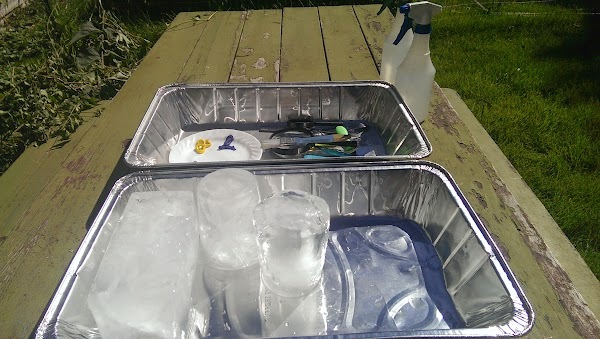 The Ice Box contained large blocks of ice made from yogurt tubs and 1/2 gallon milk cartons, spoons, forks, knives, paint brushes, watercolor paint, and squirt bottles of warm water. 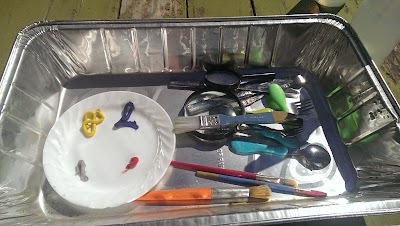 I put it all out in a couple of large aluminum trays on a sheet in the back yard and invited the kids out to play. 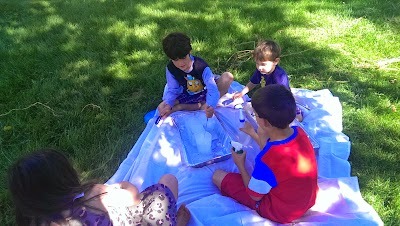 They also enjoyed painting the ice and watching the patterns of the swirls as the painted ice melted. They observed the effects of spraying a stream of water on the ice blocks versus spraying a mist of ice onto them. 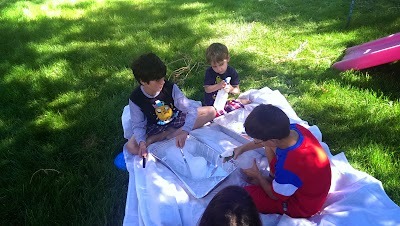 They enjoyed chipping and chiseling the ice into smaller pieces to make them melt faster. The boys did not happen to discover that they could melt the ice more quickly by using the magnifying glasses to focus the sun’s heat onto the ice. I think a small suggestion from me on using the magnifying glasses in this way could have extended the exploration a bit. As it was, they worked with the science box for a good 20 minutes before it devolved into a squirt bottle fight in the back yard. All in all, I thought our first science box was a success.